There is fashion and convenient bag which are common to see people wear, especially men. It seems that it is special designed for men, and I am rare to see women would wear this kind of bag. You must be very interested in it and wonder that what kinds of bag it is. Maybe some of you have guessed it out. Yes, it is a black chest bag. This black chest bag reminds me of the trend that occurred within last ten years when I was a little child. Men, especially those bosses or rich men love to wear this kind of bag on the waist to show their generous and stout temperament. As time passes and society develops, this kind of bag gradually fading out people’s vision. However, in recent times, it arouses a new trend among young people. I have seen this fashion chest bags with different style and different usage which can show your different feelings. I have seen some chest bag with a belt buckled on the waist. These chest bags are very sporting and very suitable for those who love outdoor sports, such as running, climbing, and riding bicycles. These chest bags with this pattern are very suitable for the middle-age men and old men. This black chest bag that I want to introduce to you is different from these bags that I mentioned above. The design of this chest bag is upgrading and becomes more suitable for fashion young people. 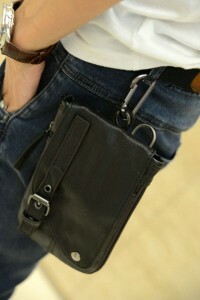 With a convenient buckle, you can tie it on your trousers belt loop. The design of this chest bag is more exquisite and fashion. It can be regarded as a good decoration for your causal dress. More than that, it can be worn as a crossbody bag with the long strip. It will definitely give you a fashion and casual feeling.